Although the horse art of David Stoecklein focuses on the working traditions and culture of the American cowboy, and his equine photography has a distinctive "Western" flavor, we've included his works in our Equestrian section since so much of his work is, in our view, "pure horse". From his home base in the Wood River Valley country of Idaho, Stoecklein captures with his camera, the beauty of that state, as well as the neighboring state of Montana and far afield to the Texas brush country. Being a rancher and lover of horses, it is little wonder that Stoecklein's photography so beautifully captures the spirit of our equine friends. Attempting to pick a favorite from Stoecklein's art isn't easy. Each photograph seems better than the last. Reverse the ordrr and you get the same result. "Palominos" above, is one favorite, "The Lesson" is another and a good one for the young rider's room. Some might say that a picture of boots would be a bit mundane for something to hang on the wall. Clicking on one of these paintings will provide an enlarged image with greater detail. You can also view other works by Stoecklein or by other artists by taking advantage of the convenient Search Box. 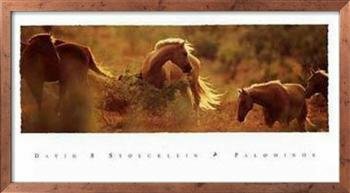 The horse art and photography of David Stoecklein is also to be found in a number of books authored or co-authored by the artist. These coffee-table books are gifts for horse lovers at their best. Just go to our I Love Horses Books page.